On March 17, the citizens of Bangladesh celebrate Sheikh Mujibur Rahman's Birthday. It is a national holiday dedicated to a preeminent Bengali nationalist leader who is considered the father of the nation and liberator of Bangladesh. Sheikh Mujibur Rahman was born on March 17, 1920. In 1943, he became a member of the Muslim League. The League's main aim was the establishment of a separate Muslim state of Pakistan. After the 1947 partition of India, Rahman chose to stay in Pakistan. Rahman struggled for autonomy and rights of Bengalis, who comprised the majority of the population of East Pakistan. He was strongly opposed to the ethic and institutional discrimination against Bengalis. On March 7, 1971 he gave a speech, inspiring the Bengali people to fight for independence. The Bangladesh Liberation War broke out 18 days later. 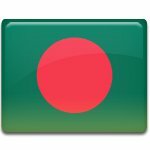 It resulted in the liberation and independence of Bangladesh. Rahman served as the first and fourth President and as the second Prime Minister of Bangladesh. The anniversary of Sheikh Mujibur Rahman's birth was declared a national holiday, and the anniversary of his death is National Mourning Day. Rahman was assassinated on August 15, 1975 by a group of military officers.